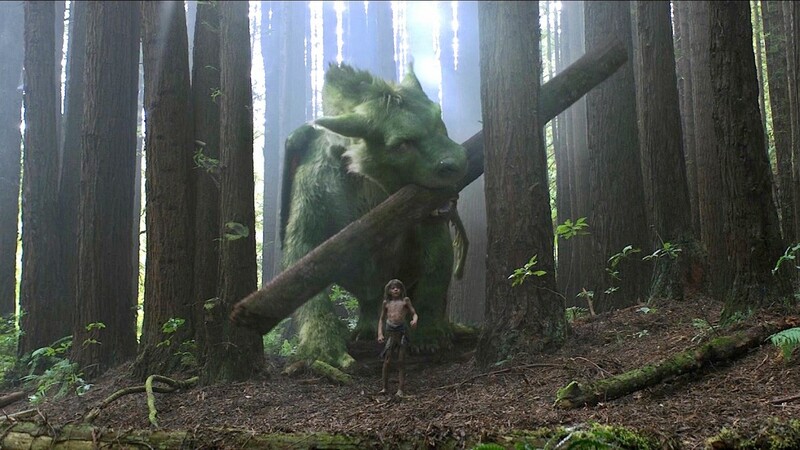 Disney is back with another one of its sometimes successful live-action remakes this time with an update on the 1977 part live-action part animated film ‘Pete’s Dragon’. The film stars Bryce Dallas Howard, Karl Urban, and Robert Redford and follows a 10 year old boy named Pete (Oakes Fegley) who is found living alone in the woods, but as his rescuers learn more about him they soon find out that according to Pete he’s seemingly been living with a dragon named Elliot, and they set out to find the truth. I don’t know what it was about this film going into it but none of the trailers had me looking forward to this film at all. Whether it was the visual appearance of the dragon or not really getting the target audience from the trailer this movie was just not on my radar. Overall this was just an ok movie, i thought the second half of the film definitely improves on the first where i wasn’t feeling the slow pace or the story initially. As the film progressed the characters did grow on me and i started getting a little more invested in the story and it finished off strong but not great overall. The film spends the majority of the first half of the film introducing you to all of the main players in the story, establishing relationships and showing you how 6 years living in the jungle with a dragon affects a 10 year old. It then moves to setting up the incident that will drive the rest of the plot forward and this whole time it holds a necessary slow pace that wasn’t bad, it was just too slow to hold my interest for a long period of time. Some of these character moments were kinda sweet and interesting, learning of Elliot and the connection he shares with Pete and vice-versa was a cool element to see but it wares out as the half way point approaches. Robert Redford was probably the most interesting character from the very beginning but unfortunately we don’t get enough of him. He has very interesting conversations throughout the film about his interactions with dragons and i spent parts of this film wishing THAT was the movie i was watching. All the other characters in the film from Grace (Bryce Dallas Howard) to Gavin (Karl Urban) were either the stereotypical good guy or the stereotypical bad guy and their characters follow an arc that you can lay out in your head from the moment you are introduced to them. For that reason many of the characters were very one note not providing many options for who to get behind. From the half way point, the film started to pick up pace, the stakes were higher, we got some more Robert Redford, and the film all of a sudden had a lot of heart and felt pretty magical. It was a pretty quick turnaround to where i was gradually enjoying the film more and more right through to the ending which closed on a pretty high note. Where initially i wasn’t feeling the look of the dragon, by this point i thought it looked pretty cool, and i’m not talking about the CGI because it is amazing, i’m just talking about the appearance. This i believe is all due to the pace picking up and some of those earlier introductions to Pete and Elliot paying off, and i really got behind them and was able to root for and against characters who i initially felt very indifferent about. One half of a good film doesn’t make this a great one but i left this film pretty positive feeling like it redeemed itself for the patchy first half. So in the end this was an ok family film with a second half that builds on the few good elements of the first half to give you a somewhat worthwhile experience in the end. It has plenty of heart and ends up being a very sweet story about the relationship between a boy and his dragon. If it wasn’t for the slow pace just feeling like the film was occasionally dragging slightly it could have been a great movie. I don’t know how much kids would like this film as there is that cute, fluffy dragon for them but it is a little more mature at times so it’s up for personal preference i guess. Previous ‘MOANA’ (2016) MOVIE REVIEW – Walt Disney Animation Studios….. Need I Say More?